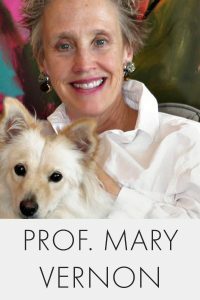 Prof. Mary Vernon serves as Professor of Art and Altshuler Distinguished Teaching Professor at Southern Methodist University. Vernon teaches painting and drawing, and SMU’s noted color theory course. She was born in New Mexico, educated at the University of California, Berkeley, and the University of New Mexico, Albuquerque. Mary Vernon has shown her work in France, Hungary, Chile, and Kazakhstan, as well as nationally, and is represented by Valley House Gallery of Dallas. Collections that include her work are: The Belo Foundation, The George W. Bush Presidential Library and Museum, SMU’s University Art Collection, The Dallas Country Club, University of Texas Southwestern Medical Center: William P. Clements Jr. University Hospital, and Ebby Halliday Realtors, along with many private collectors.